Affordable dream location Located in the heart of Temecula wine country. Walking distance from Lorimar Winery and minutes away from downtown. Anything possible at this venue A magical wedding venue, birthday party, bachelorette party, baby shower or just because you want a peaceful place to enjoy your vacation. 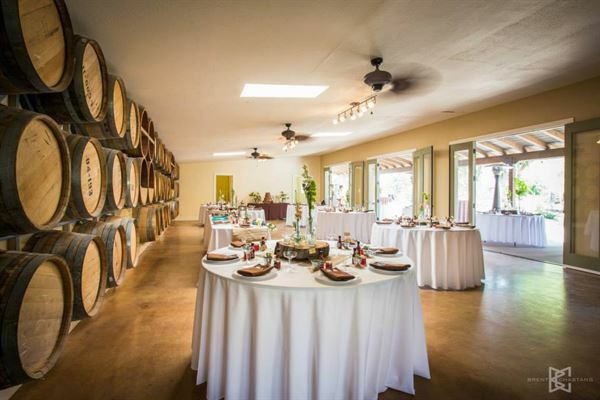 We have an event lawn and a barrel room for events up to 100 people. There is an event fee for use of both the event lawn and barrel banquet room, we supply everything you need to host your party. Home rental $850 for weekends and $675 for weekdays, with a 2 night minimum stay. This is the perfect place for your wedding, business retreat, or any special occasion. Enjoy a simple weekend getaway, customize your own event, or allow us the privilege of working with you to design that special occasion of your desires.